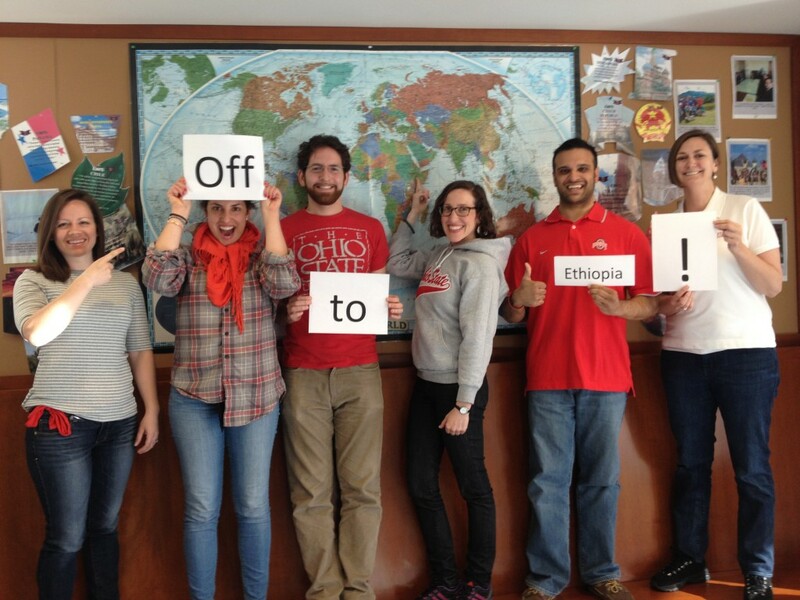 Seven Master of Business Administration students from Ohio State’s Fisher College of Business will visit Ethiopia for three weeks in May as the in-country portion of our Global Applied Projects class. The class is taught by Kurt Roush and advised by Professor Scott Livengood. We are: Javed Cheema, Katie Fornadel, Carla Garver, Alejandra Iberico Lozada, Daniel Meisterman, Niraj Patel, and me, Danielle Latman. Combined, we are from three different countries, have traveled to almost 70 countries, and have 65 years experience in sales, marketing, operations, financial services, nonprofit and military industries. From left: Katie Fornadel, Alejandra Iberico Lozada, Daniel Meisterman, Danielle Latman, Niraj Patel and Carla Garver. Not pictured: Javed Cheema. The Ohio State / Ethiopia One Health Partnership asked us to harness our business skills to help operationalize the partnership’s rabies elimination project, adding a layer of practical implementation to the research and training that veterinarians and scientists have already developed. We have split up into teams focusing on the finance, marketing, operations, logistics and data collection functions of the rabies elimination project. Our goal is to develop a proposed roadmap that will allow the U.S. And Ethiopian partners to implement the rabies elimination One Health model project on a targeted region in Ethiopia. We will travel to Ethiopia from May 1-25 to work with officials in Addis Ababa and Gondar. For the past seven weeks, we have met with the CDC, Drs. Gebreyes and O’Quinn, cultural anthropologists and social service agencies to prepare for our trip. We have also eaten at the lovely Lalibela restaurant here in Columbus, received our travel visas, and gotten a lot of shots — and were dismayed to find a shortage of the yellow fever vaccine in the U.S.! For all of us, this will be our first time visiting Ethiopia and sub-Saharan Africa in general, and we are excited for what are sure to be many new and rich experiences! We are looking forward to exploring the natural environment of the Blue Nile Falls and Simien Mountains, driving overland from Addis Ababa to Gondar, seeing the history of ancient castles and churches, visiting marketplaces and drinking delicious coffee with each other and our new colleagues and neighbors. We are thrilled for the opportunity to contribute our business skills and passion to build on the One Health Partnership’s success and help eliminate rabies in Ethiopia. Posted by omalley.44@osu.edu at 11:45am April 24, 2014 Posted in Uncategorized and tagged Addis Ababa, Africa, Business, Ethiopia, Fisher College of Business, Gondar, Ohio State University, one health, Rabies, Student post, Wondwossen Gebreyes. Bookmark the permalink. Thank you, Marie! We appreciate the good wishes. Thank you, Edwin! We appreciate your support. You are all amazing! Will follow your blog and we are with you 100%. Thank you so much! We are following all recommended safety precautions, such as traveling together and taking malaria pills. I wish you a fantastic time here in Ethiopia! Thank you, Gebrerufael! We are having a wonderful time so far. We will update the blog soon so you can follow our work.